Middle Eastern style cabbage rolls, stuffed with spiced ground beef. A Syrian mother's recipe. Preheat oven to 350 degrees F. Lightly grease a casserole dish with cooking spray. Bring a large pot of water to a rapid boil. Cut a circle around the stem of the cabbage and remove the core. Carefully place head of cabbage into the boiling water. After about 1-2 minutes, the top leaf will come off easily when tugged with tongs. Remove from the water and transfer to a large clean work surface. Wait another minute and remove the next outer leaf. Continue until you have 10 cabbage leaves removed. Turn off the heat, and discard the rest of the cabbage or reserve for another use. Pat the leaves dry with paper towels. Cut out the thick part of the rib (creating a "V") from the bottom of each leaf, but don't cut more than a third of the way into the leaf. In a large bowl, mix together the ground beef, melted butter, cooked rice, cumin, allspice, salt and pepper. I use my hands to get it fully combined. With the stem side of the cabbage leaf facing you, divide the meat mixture evenly over the center of each leaf. Fold the bottom edges over the mixture and then fold the sides over and roll tight. 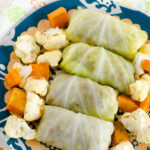 Place the cabbage rolls, seam side down, in the prepared baking dish. Cover with foil and bake for 1 hour. Serve immediately with roasted vegetables, Pita bread and tabbouleh for a full Middle Eastern feast.